During a collision between protons in the particle accelerator LHC, an enormous shower of particles is always released. This large quantity of particles forms the noise in which interesting signals, such as the Higgs particle, the top quark or even unexpected particles, are hidden. Physicists want to understand this noise as well as possible. They can then remove it from the measurements to more easily expose the signal they are searching for. The noise consists of radiation from partons (quarks and gluons). These particles emit quarks and gluons, which in turn can emit quarks and gluons as well. This quickly gives rise to a shower of particles. Exactly how this happens is particularly interesting. Researchers are trying to accurately describe this process, preferably in the form of a Monte-Carlo simulation. During such a simulation the process is many, many times repeated with random variables as a result of which all possible outcomes occur. During the past year, the researchers from this FOM programme have developed a new method that improves the simulation on two fronts. First of all the basic element of the shower, the emission of an extra gluon or quark, is no longer based on a monopole model in which a parton splits into two particles. Instead a quark-antiquark pair, a dipole, collectively emits a gluon. This model has the advantage that both energy and the conservation of impulse are taken into account. Secondly the researchers have included 1-loop quantum corrections in the method. This can be realised accurately via a mechanism that adjusts the Monte Carlo probability in the simulation from the approximate calculation to the exact calculation, each time after a particle is emitted. An important aspect of the research was determining the optimum evolution variable. Such a variable also functions as a clock. It increases each time a particle is emitted. Furthermore, a new clock is created each time. The best choice for this variable proved to be the impulse of the particles that is perpendicular to the main axis of the collision. The researchers tested the new method by applying it to measurements from the recently dismantled LEP accelerator at CERN. The method proved to work perfectly. Now they are busy expanding the simulation to proton collisions in the LHC. 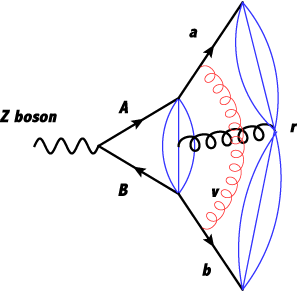 A dipole antenna, formed by a quark (A) and an antiquark (B), emit a gluon (r). Now there are two antennae: the combination of the quark with a gluon (a-r) and a combination of a gluon with the antiquark (r-b). The gluon (v) switching from a to b forms a quantum correction. The blue oval shapes indicate the antennae.